This is Anthony Doerr's debut collection of short stories. The collection takes readers all over the world, including the African coast, the pine forests of Montana, and the moors of Lapland. Doerr creates both physical and emotional landscapes with each story and explores the human condition in its varieties spanning across different ages and relationships in life. Metamorphosis, grief, fractured relationships, and slowly mending hearts are all themes that intertwine with setting, especially highlighting nature in both its beautiful abundance and crushing power. Some of his characters contend with tremendous hardship; some discover unique gifts; all are united by their ultimate deference to the mysteries of the universe outside themselves. Folded Pages Distillery usually reviews novels, but I decided to take a detour from that norm and take a closer look at the often forgotten or belittled short story form. I genuinely believe this form of writing, as well as poetry in many instances, is being neglected in our current literary world. Many even look down on it, perhaps believing that if one can't read or write a novel then one isn't up to reading or writing at all. However, I truly hope this prose form makes a comeback, which with writers like Anthony Doerr I don't see why it couldn't, because in the fast-paced and time-obsessed world we now live the short story could actually find a loving home. If one doesn't have the time or energy to read an entire novel, or keep up with the twists and turns because of constantly having to put it down and pick it back up a few days or weeks later, then I highly recommend picking up this collection of short stories. It takes somewhere between 45 minutes and two hours, depending on your level of distraction or comfortable reading pace, in order to read one of these stories. That is much more comprehensible than picking up some other 500+ page contemporary novel and it's not daunting at all. Even more convincing than the lack of time this collection will take up of your daily life, I would argue that finishing each of these stories left me with a sense of peace and catharsis, just as I feel when I finish one of those 500+ page novels. Also, they can be read in any order that suits your interests, no one will judge you for skipping or backpedaling through this work. I'm not going to lie, however, peace and catharsis do take some emotional and mental work to achieve. These stories are not necessarily calm or for those looking to laugh easily. Every story made me smile at one point or another, perhaps out of poetic irony or futility, but I did smile nonetheless. I also found myself reflecting upon my own life and wondering how a short story could make its way inside of me and change how I look at the world so quickly. With every ending, I will also caution you, I found myself wondering why it ended there. To be honest every story in here could be developed into a full novel, but the more I thought about it the more I found that Doerr knew exactly when and how to finish each peace perfectly. Each one will leave you wanting more, but also feeling somehow whole and complete by the ending he has written. 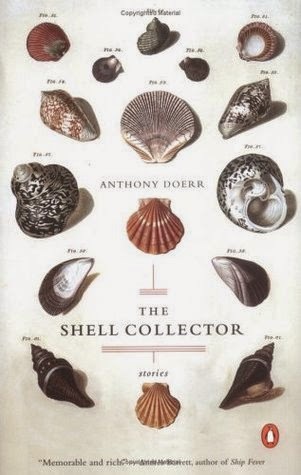 It is hard for me to pick a favorite story from The Shell Collector, but as I write this review my thoughts wonder back one in particular. For a Long Time This was Griselda's Story envelopes the life of two sisters and tells of how both of them create their lives completely differently, but at least one ends up with exactly what she needed... even though it wasn't what she always wanted. I hope you enjoy these stories as much as I did and that you are willing to give short stories a chance in your life. It's getting a little colder out as Autumn settles in and I think I picked out the perfect drink to keep you feeling warm while reading this collection, Mexican Hot Chocolate. It might even make you feel as though you are experiencing something exotic and new as you travel from story to story. I especially recommend this drink while reading The Hunter's Wife, which made me feel cold even while I was reading it on a hot summer day. Here is a recipe I found online that will be perfect to keep you warm through those long Montana winters.